Jewish date: 7 Tishri 5771. Today’s holidays: Ten Days of Repentance (Judaism), Feast Day of Our Lady of Sorrows (Roman Catholicism), Paryushana (Hinduism), Feast Day of St. Gilles de Rais (Church of the SubGenius). Worthy causes of the day: “DemocracyForAmerica.com » Stand with Patrick Leahy”, “Save Darfur Coalition: Give just 60 seconds for Sudan”, and “Tell Congress: Don't extend the Bush tax cuts for the wealthy”. I apologize for not having posted earlier this week. I am keeping busy with other things (such as getting ready to move to Israel) and allergies. Expect a lot of posting disruptions for the next few months because of the move. Also expect a different posting schedule after the move, at the very least posting happening at different hours. I also would like to apologize for neglecting current religious news, such as everything surrounding the Cordoba Initiative’s planned mosque near Ground Zero (a lot of it paranoia, ignorance, immaturity, and dishonesty) and Dr. Stephen Hawking’s unjustified claims about the existence of God. This is not a denial of the importance of these topics. Rather, I feel it more important that I generate content than simply comment on other people’s content. I was in Israel recently, and I saw things not discussed in the news, and no one can report on what I saw but myself. The current “Old City”, which has the Temple Mount at its southeastern corner, was (re)built by the Ottoman Turks, making it the “Old City” by virtue of the fact that the rest of modern Yerushalayim grew (and continues to grow) around it. It is not a modern city. The streets are mostly narrow and unsuited for automobile traffic. On those streets that can carry vehicular traffic, pedestrians are frequently dangerously close to vehicles. Some streets are largely or entirely covered overhead and are more properly corridors rather than streets. 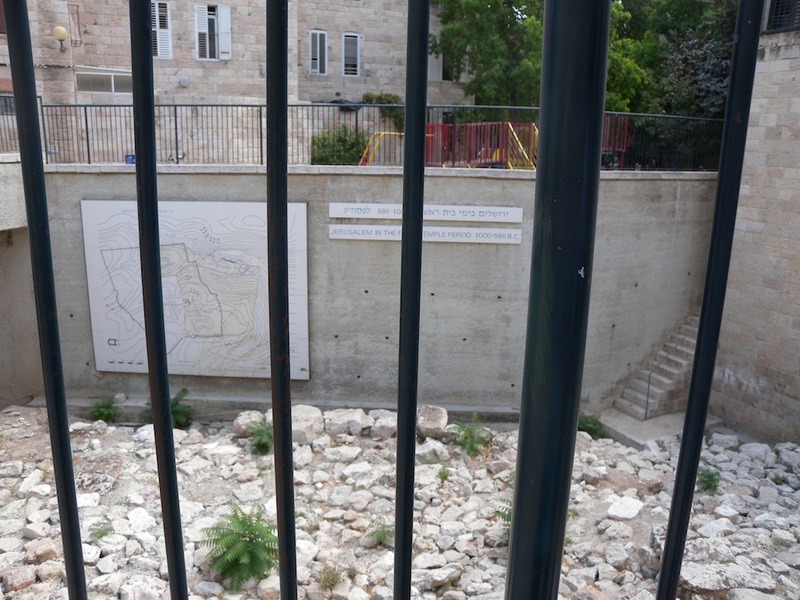 The Western Wall and the Jerusalem Archaeological Park, which are properly in the Old City, have been discussed previously in this series. 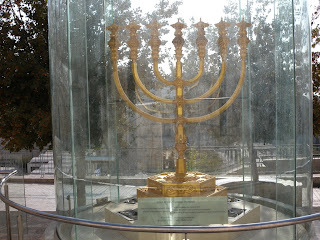 And the Temple Mount itself, as I have not visited it yet, I plan to discuss when I do visit it (YHWH willing). So what does that leave to discuss? 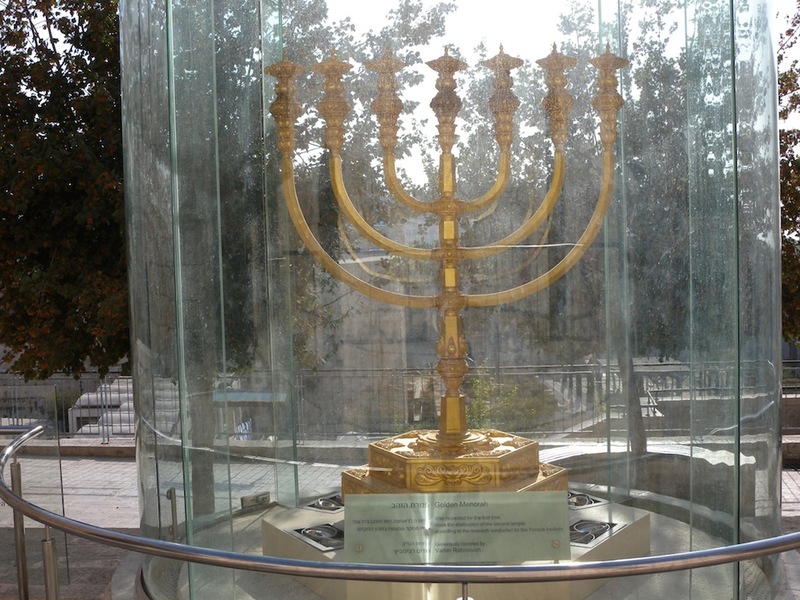 This is the menorah (candelabrum), which they are probably willing to have out in public due to the fact that it is large and heavy enough that carrying it off would be at best difficult, given that people walk by it 24 hours a day and there is nowhere to park a getaway vehicle. Many other utensils, such as the shulḥan (table for showbread) and incense altar, are housed in the Temple Institute itself. Reportedly there has been work on the main altar, though I do not know where that is housed. 2) The Church of the Holy Sepulcher. 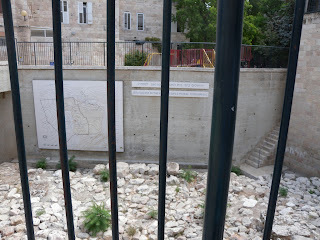 This is where Jesus is supposed to have been crucified and buried. I did not visit it so much as stick my head in the courtyard where it stands and take two pictures. (Maybe I will feel a bit braver next time about approaching it, though entering it is out of the question. If I take a non-Jewish friend with me next time, I may get some pictures of the inside.) 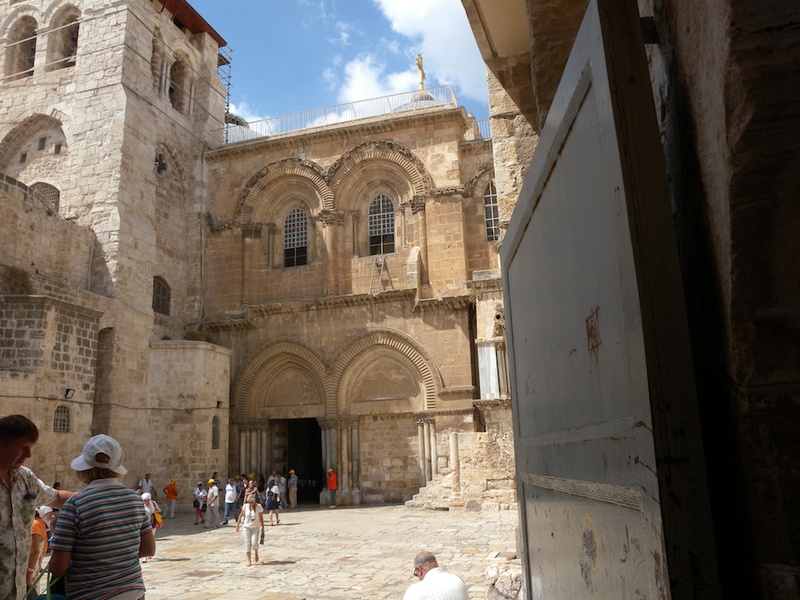 This building is reported as being claimed by all the major pre-Protestant Christian churches, and the truce under which they share it is tense at best. At the right upper-story window you will notice a ladder; it has been there for a few hundred years because the factions cannot agree on who has the right to take it down. It has been moved around a bit in contravention of the refusal of the factions to agree on who can move it. I am not sure what Jesus would have made about all of this, though I suspect Christians may find inter-Jewish squabbles just as impenetrable and weird. 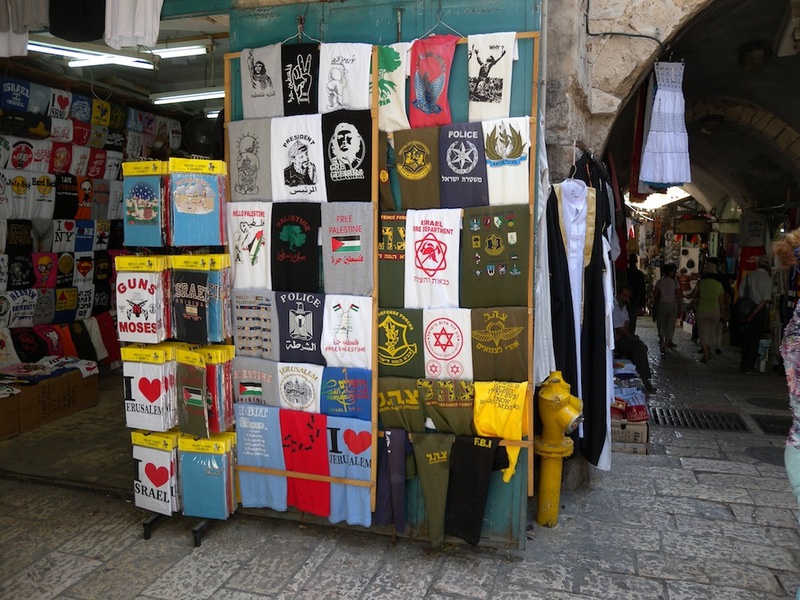 Notice the presence of pro-Israeli and pro-“Palestinian” T-shirts. 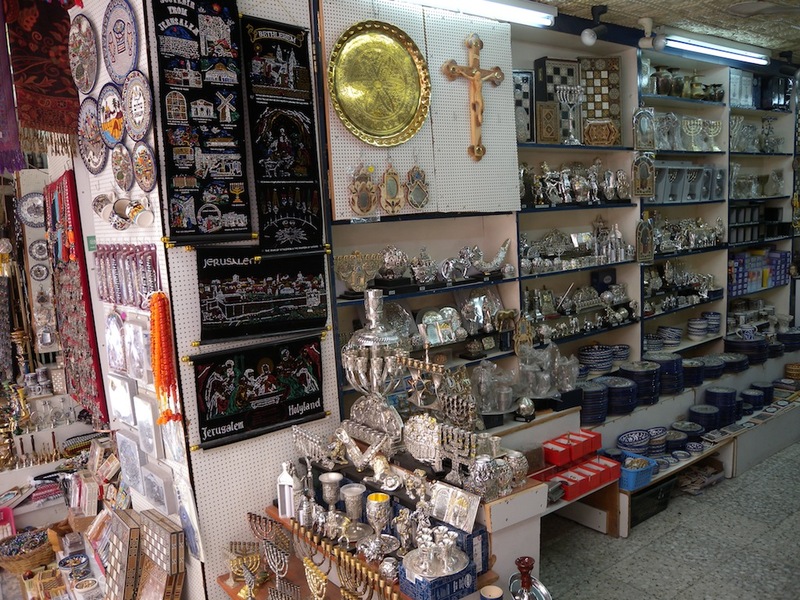 Notice a lot of Judaica—and a big crucifix. Here is a real doozy. 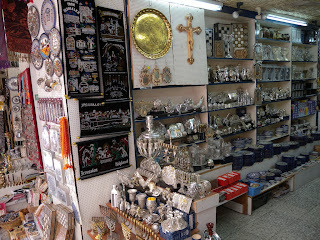 Lots of Judaica, but also those fancy eggs favored by Orthodox Christians and evil eye amulets in a style favored by Turks. Notice the menoroth have seven branches; such a style is supposed to be reserved for the Temple and not for general use. 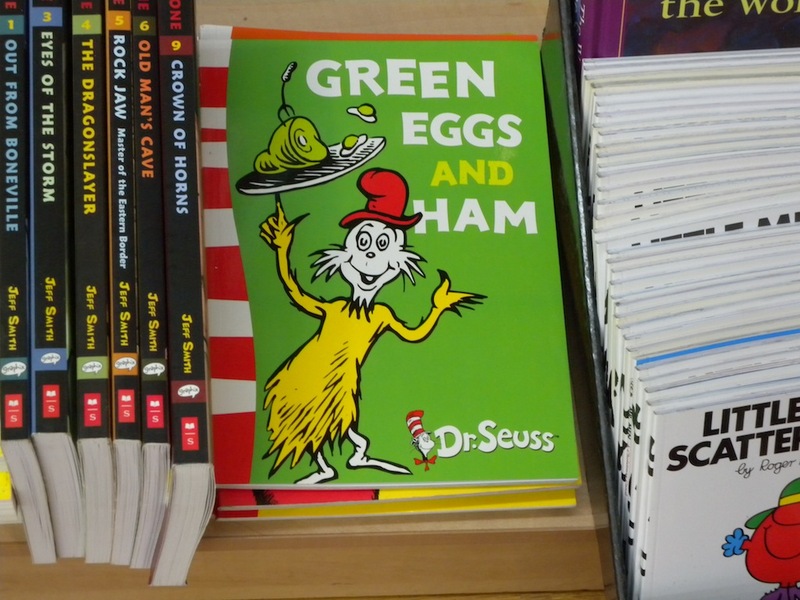 (But it may be a bit much to expect a Muslim shopkeeper to know and respect this.) 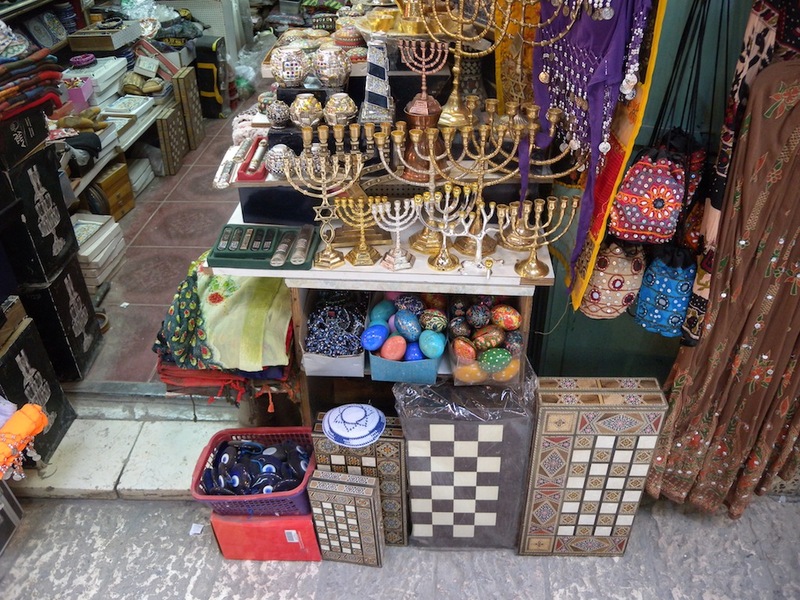 There were also a number of other items, such as chessboards and six-string ukeleles, which kept showing up at the shops, but whose connection to religion or Yerushalayim I am unaware of. There is nothing wrong with this book, but somehow Green Eggs and Ham in a country where the two most popular religions forbid eating pig meat seems rather odd.